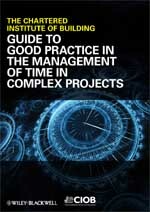 Wiley and the Chartered Institute of Building have just published a new book, the Guide to Good Practice in the Management of Time in Complex Projects. The primary purpose of this Guide is to set down the standards necessary to facilitate the effective and competent management of time in complex projects. It defines the standards by which project schedules will be prepared, quality controlled, updated, reviewed and revised in practice and describes the standards of performance which should reasonably be required of a project scheduler. The Guide has been developed as a scheduling reference document capable of wide application. It is a practical treatise on the processes to be followed and standards to be achieved in effective management of time. It can be used in any jurisdiction, under any form of contract, with any type of project and should be identified as the required standard for the preparation and updating of contract programmes, progress reporting and time management. I may be biased, my partner was part of the team that developed The Guide and it recognises the importance of involving stakeholders in the development of the schedule, but I feel it has a lot to offer project planners and schedulers on any type of project. A common fallacy is the assumption that effective risk management systems will remove or eliminate all risk from a project or a business. $millions are spent by organisations trying to avoid risk and they fail. It is not possible to predict the future with certainty, if it was possible, casinos and bookmakers would be bankrupt. What is possible is to proactively manage known risks in a way that maximises opportunity and minimises the damage caused by threats that eventuate. It is also possible to refine and improve systems to minimise variability and therefore increase predictability. Sensible management balances the gains from improvements in the risk exposure against the costs and optimises the outcome. But this leave three areas of risk unaccounted. The first is the known risks that it is simply too expensive or too difficult to reduce any further. The second is the known risks that simply cannot be managed or transferred. The third category is the unknown unknowns, the risks we simply don’t know we don’t know about. All three of these risks can be offset by the creation of contingency allowances but this is expensive and potentially wasteful. Because we cannot know what we don’t know it is impossible to calculate appropriate contingencies. Another approach is needed. Resilience is the ability to recover quickly from an unforseen event or ‘the ability of a system to return to its original state after being disturbed’. Build resilience into you business unit or project team and you have the capacity to deal with the consequences of unforseen risks. I have been rather aware of the recent problems experience by Qantas given I’m flying on one of their aircraft from Sydney to Argentina on Monday! The major issue was the uncontained explosion of a Roles Royce Trent 900 jet engine after take off from Singapore on November 4th. Commercial airline engines are not supposed to explode! Whilst they break reasonably frequently, all of the debris are supposed to be contained within the engine. The Qantas A380 suffered shrapnel damage to wiring, its fire systems and wing fuel tanks (the plane was extremely lucky to avoid a catastrophic fire). One of the factors that saved the situation was the flight deck crew. By chance there were four highly experienced pilots and a second officer on-board. Qantas routinely use two experienced pilots as captain and First Officer, in addition there was a senior ‘check captain’ undertaking a ‘route check’ on the pilots and another senior officer checking the checker. Between them the crew had over 60,000 hours of flying experience and they still had to work flat out for over an hour to understand and control the situation before making a safe landing. The flight crew had an abundance of resilience created by the experience of the flight crew. This was partly good luck and partly Qantas policy. There was enough brain power, experience and wisdom to stay on top of the situation. Whilst every airline trains its crews in flight simulators to deal with all sorts of emergencies, you can virtually guarantee Qantas had not trained its crews specifically for the circumstances that occurred on the 4th November. They were never supposed to occur; the situation was probably closer to what happens when a large aircraft is hit by a missile then any normal emergency. So how do you build resiliency into a work team? There seems to be three elements. The first is to have practiced dealing with a range of emergency issues needing responses. This helps develop systems and procedures. The second is to have spare capacity available to the team. It’s unlikely you can afford the Qantas solution of two qualified captains ‘on deck’ but it should be possible to develop flexibility within the larger organisation to make resources quickly available and to have those people familiar and friendly with the core team so they ‘fit in’ quickly. The third element is trust. Everyone needs to be able to trust their team mates and understand their capabilities. The value of trust is discussed in our WP1030 – this is even more important when dealing with an unexpected risk event. Resilience is not an accident; it is created by implementing strong processes, procedures and systems. These are far better value drivers than contingencies. Contingencies add no value; they are simply drawn down in emergencies. Resilient systems are also effective systems and therefore value creators. However, there is a risk associated with resilience. Resilient system that can absorb issues and catch risks before they become significant appears to be a ‘comfortable system’. Unwise cost cutting can remove resilience and in the short term there appears to be no disadvantage. However, this is a very dangerous illusion. As the system is rendered less effective issues get picked up later and require more resources to correct. This further destabilises the system and the ‘tipping point’ into dangerous disfunctionality can easily be passed without anyone realising there’s a problem until the next risk event occurs and the system fails. Resilience is a valuable asset. Management need to make sure it’s cultivated and nurtured to support the other aspects of effective risk management. I confess that in 1901 I said to my brother Orville that man would not fly for fifty years. Two years later we ourselves made flights. This demonstration of my impotence as a prophet gave me such a shock that ever since I have distrusted myself and avoided all predictions (their first successful flight was in 1903). But most of our project stakeholders expect predictability, we predict budgets time frames and delivery dates and they expect us to deliver. The challenge for us all is to effectively manage these expectations – unrealistic expectations are unlikely to be fulfilled. We have updated our PgMP course offering to include a service where we cut an applicant’s CV to the PMI format using our Word Template and return the PMI version to the Applicant with a brief report on the additional information needed by PMI to complete their CV in the PMI format, plus suggestions for the multi-rater panel. Names in the CV and the multi-rater panel are cross linked by PMI. This initiative is expected to save PgMP applicants between 8 and 12 hours of effort. For more information see our PgMP Home Page. Oracle have announced that the last opportunity for existing customers/users to purchase Oracle Primavera P3 and SureTrak licenses closes on 31st December. As of 31st December 2010 all sales of P3 and SureTrak will cease and there will be no further development of these products (including patches). However, technical support and replacement media will continue to be available. Primavera / Oracle suggest P6 Professional and/or Primavera Contractor as suitable replacements. Whilst these are excellent products and the release of Primavera P6 v8 has added a lot of useful functionality, there’s a quantum difference between an effective project scheduling tool and an effective enterprise scheduling tool. P6 is an excellent enterprise tool. P3 and SureTrak were some of the best project scheduling tools I have used. I suspect the ending of the P3 era will see other project scheduling tools such as Asta Powerproject and Micro Planner gain market share. It is impossible to all things to all people and Oracle Primavera has moved decisively into the enterprise management arena. P6 v8’s ability to integrate and manage resources across the enterprise is unequalled. But Enterprise systems need effective enterprise support offices (ie, PMOs) and an enterprise view from the top down. The power of an ‘enterprise’ tool set becomes unnecessary complications for a single project user, or a user with multiple individual projects each with completely different scheduling requirements. Its horses for courses and users need to understand their needs to select the optimum tool. In the meantime I will be drinking a toast to end of two old fiend’s careers. ﻿We appear to be hardwired to procrastinate! Without an effective set of countermeasures, we almost inevitably delay difficult or uninteresting work until the last minute when time ultimately makes us choose the undesirable and risky. The brain is built to firstly minimize danger, before maximizing rewards. Too much uncertainty feels dangerous so we avoid it. We are not good at predicting what might make us happy. Our capacity to regulate emotions is limited and our intentions and goals alter the information that the brain pays attention to. In combination all of these traits make if far preferable to do something simple now for an immediate reward, or nothing at all, in preference to something more difficult and therefore risky for a more valuable reward in the future. This is called Hyperbolic Discounting; most of us will take $100 tomorrow in preference to $1000 in a year’s time. The other source was posts by Dr. David Rock; http://www.psychologytoday.com/blog/your-brain-work . The overall consensus is we procrastinate by design but we can also manage this tendency by effective negotiations with our self. Brute force attempts to suppress procrastination by ‘force of will’ are doomed to failure; smart tactics that reward yourself for necessary achievements and accept the inevitable relapse from time to time are far more effective. Some ideas on personal time management are in our latest White Paper Personal Time Management.